No sign up/account required. No tacky built in images. No network connection needed. Just a simple way to make lists and tick things off as they're done. Three views - "All", "To Do" and "Done" lets you focus on what's important. 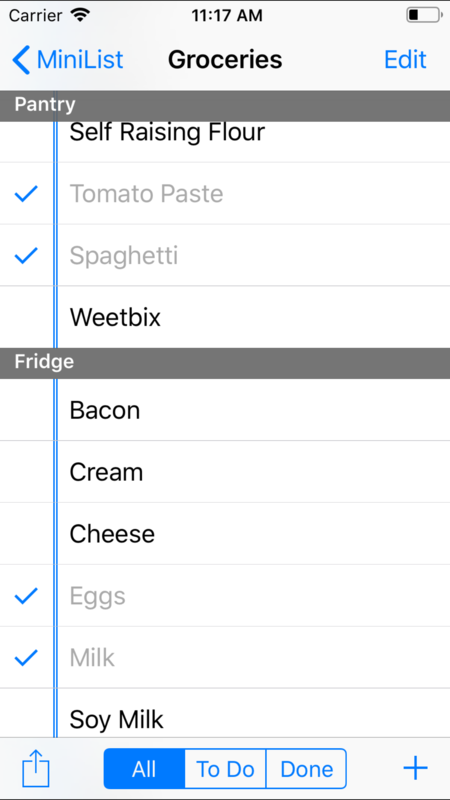 "Pick Mode" lets you re-use your weekly grocery list - just tap the items you need (multiple times to record a count) and you're good to go. You quickly create a list by tapping and holding on the + button on the home screen. To insert an item into a list, tap and hold on an existing item and choose "Insert Above" or "Insert Below". Tap the "Edit" button on any screen to re-order and rename items. You can delete all checked items via the menu button at the bottom left. Lists are saved as plain text files which are accessible via iTunes documents. Sometimes you might like to re-use a list multiple times. eg: your weekly grocery shopping list might have your regular grocery items. When it comes time to do your weekly shopping you probably just want to pick items from your existing list. 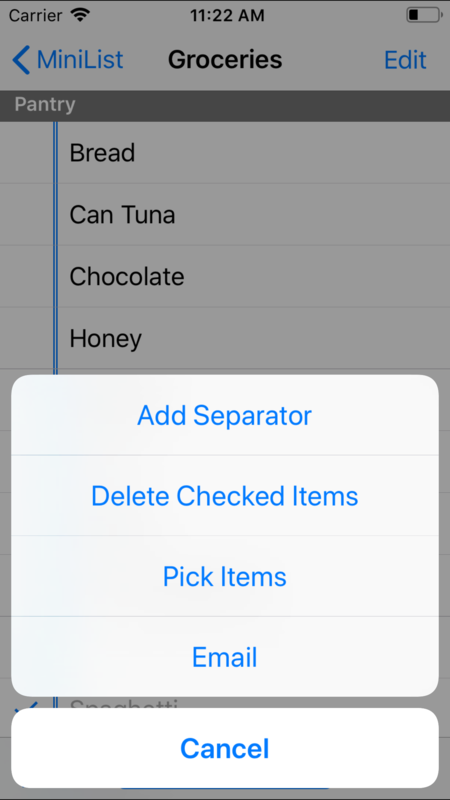 Create a list and enter all your grocery items (you can add more later - you don't have to add everything right now). From the menu at the bottom left, choose "Pick Items". From the same menu on the pick items screen, choose "Clear All". Go through the list tapping each item you need. 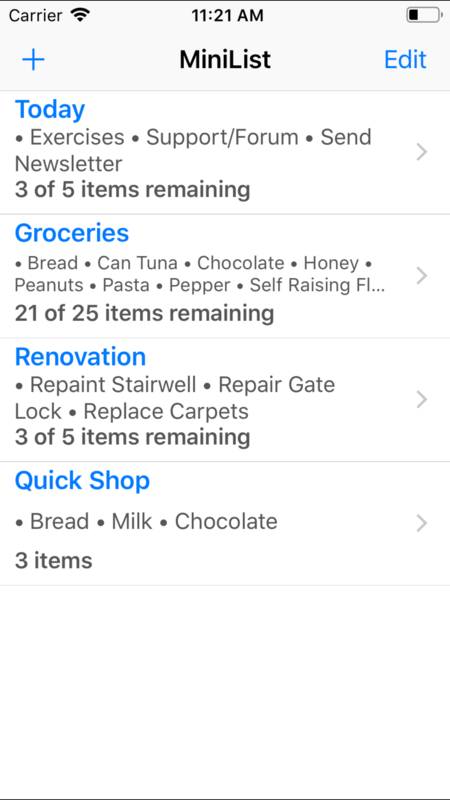 Tap an item multiple times to record how many of that items you need. eg: if you need two loaves of bread tap on "Bread" twice. To clear the count on an item, click on the checkmark - that'll reset it to zero. MiniList stores your lists on your phone. It doesn't upload it anyway, we never peek at it, we never include it in crash reports. Nothing. Note: this also means you need to back up your phone. If you lose a list, we can't get it back for you.